Why put together an index of gender equality in Canada? Why rush in where my better colleagues have warned me not to tread? As these things so often do, it started with frustration. None of the major international indices of gender equality include a measure for gender-based violence. This means that a country could conceivably hold the number one position in the UN Gender Inequality Index and have rampant levels of domestic and sexual violence. At this point, I have to believe that the resistance to including measure related to gender-based violence is, in part, political. Many of the things that international organizations measure tilt clearly along income lines. That is to say, low-income countries score near the bottom of the measure and high-income countries score near the top. Gender-based violence is not one of those things. Everyone comes out looking bad. The World Health Organization estimates that 1 in 3 women (in low and middle-income countries) and 1 in 4 women (in high-income countries) will experience gender-based violence in their lifetime. That’s not exactly bragging rights for the high-income countries who, incidentally, tend to put up the money to fund these kinds of indices. And so it came to pass that I decided to make my own index of gender equality. If I only measured cities in Canada, surely there would be no problem including these kinds of statistics? Silly me. Like most countries, the only gender-based violence statistics Canada collects on an annual basis are police-reported incidence of crime. Once every five years we survey people directly (the best way to measure gender-based violence). However, this survey asks only a few questions about gender-based violence and does not sample a large enough portion of the population to provide rates of crime at the provincial or municipal level. All of which is why I regularly and repeatedly do something that goes against all my instincts for research-ly self-preservation: point out the deficiency of my own data. You will find repeated twenty-five times in every annual report on the best and worst place to be a woman in Canada a warning about the total inadequacy of the statistics that I use to measure security. Having confessed this, the first of my methodological sins, allow me to continue. Not all women are the same. Not all inequality is gender-based, (or exclusively gender-based). Yet, there are no annually available intersectional statistics for the indicators that I use in the report. Even if I only issued the report once every five years, allowing for the use of census data, there would still be significant gaps. I might be able to measure differences in economic well-being for racialized, disabled, indigenous, and immigrant women. But I wouldn’t be able to provide estimates of differences in health or rates of violence. In this way, the index will always be inadequate. It cannot capture the intersectional lines of discrimination faced by diverse communities of women. Finally, for the last of my sins, the project of an index is itself a hazard. My colleague Debra Liebowitz, angel on my shoulder, has pointed out at length the dangers of using such indices. They risk reducing all discrimination to a few data points. They incentivize policy makers to focus on increasing their performance on the points being measured, rather than looking holistically at what would make better lives for women— a kind of teaching to the test at the political level. Why persist in producing this report? The first answer is that it is the best way I know to pressure our government into collecting better data. I am happy to say that there are signs that a new survey on violence against women is in the works. It is unclear at this point if it will be annual. It is unlikely it will survey a large enough population to measure levels of violence at the municipal level. Thus, we will continue not to know if the programs being implemented at the municipal level are working or not. But it is a first step, and it is in the right direction. The second answer lies in a totally unexpected outcome of the project. When I produced the first report four years ago, I expected that the focus would be on how Canada’s largest cities ranked (Toronto, centre of the universe). I was totally wrong. Regina wanted to know how Saskatoon fared. Calgary was only interested in Edmonton. Victoria said ‘take that Vancouver.’ The status of women in cities across Canada had become a matter of civic pride. This, to me, is the most powerful impact of the index. Gatineau’s mayor tweets that he is proud that their city has the smallest wage gap. Edmonton city council approved funding for women’s shelters because, in the words of one councilor, they didn’t want to be the ‘worst city in Canada to be a woman’. There are women’s leadership programs in the works in St. Catharines and Edmonton. Hamilton continues to campaign to elect more women to municipal office. Windsor responded to being at the bottom of the ranking last year with a documentary that features a diverse array of women, their accomplishments, and their affection for their city. I hear they are planning a sequel. It’s not hockey. Not yet. But if it means we start to truly see women in all their diversity and to recognize that their well-being is fundamental to our community’s well being…well, how does the Best Place to be a Woman Cup sound? 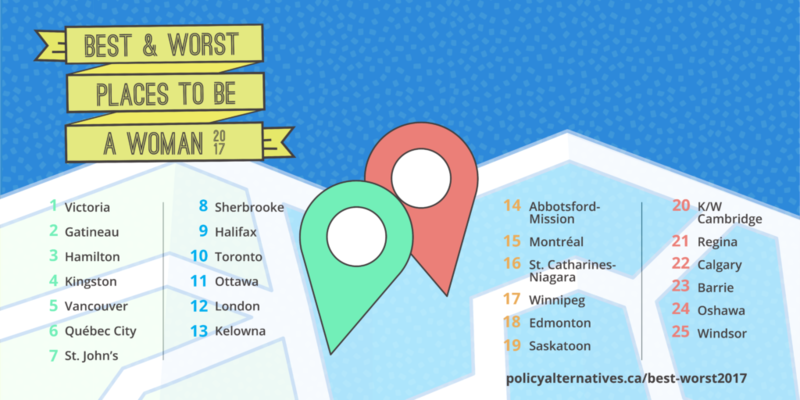 • Best and Worst Cities to Be a Woman in Canada: How is BC doing?